The Mainstay/Whyaka Group performing a dance last evening at the launch of Amerindian Heritage Month. Minister Valerie Garrido-Lowe yesterday urged the Indigenous Peoples to think about their future in modern Guyana and how they can contribute to its development. 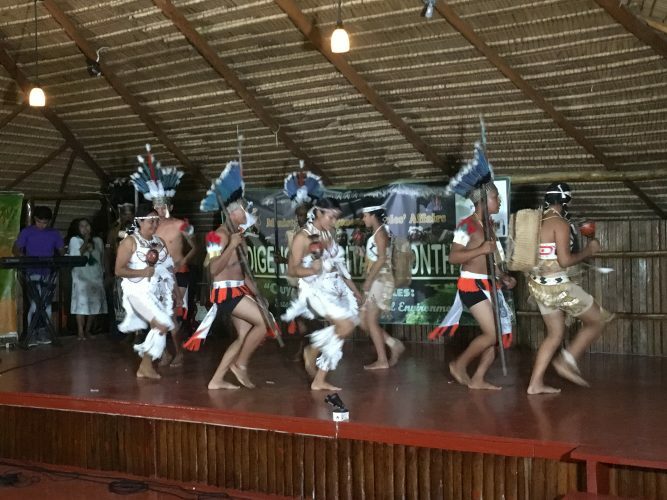 Amerindians from Brazil and Suriname were among those gathered at the main building of the Heritage Village at the Sophia Exhibition Centre for the launch. The programme was kicked off by a rendition of the National Anthem by the Guyana Police Force’s Steel Pan Orchestra, which was followed by the National Anthem and a prayer in the Akawaio Language by Ronald Joseph. The crowd was also entertained by various heritage groups. 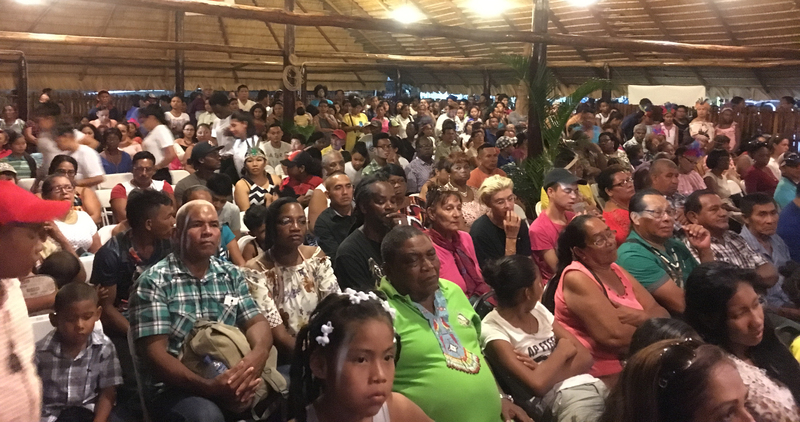 A section of the gathering yesterday at the launch of Amerindian Heritage Month 2017. A dance by the Surama Culture Group at yesterday’s launch of Amerindian Heritage Month 2017. Delivering the opening remarks, Garrido-Lowe, encouraged the gathering to ponder on what and why they are celebrating. “What about indigenousness are we celebrating and what have we achieved for the betterment of country and people?” she asked, while stating that even though the Amerindians have been in Guyana for “a very long time,” thoughts about their future and where they see each other in modern Guyana should be paramount in their heads. “…But what do we stand for? What are our principles? Where do we see each other as indigenous people in Guyana?” Garrido-Lowe questioned, while stating that as an indigenous woman and person she sees far into the future about her people’s standing in modern Guyana. “Nothing is easy and nothing is going to be free except those that God gave us…,” she said, while pointing out that how the lands are utilised and cared for and how climate change is fought should also be important topics. 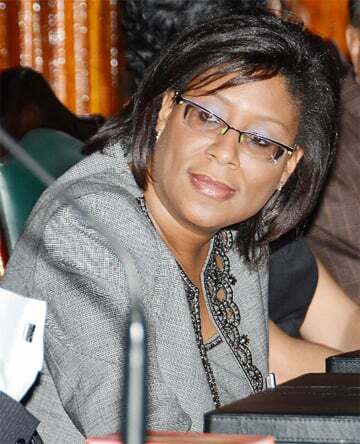 She also said that it is equally important for Amerindian youths to strive to be engineers and geologists and pursue other careers to assist in developing the country. Speaking also at the launch, President of the National Toshaos Council (NTC), Joel Fredericks, said that he is noticing that some young people are losing their culture. “You cannot change who you are and always be proud of who you are and your ancestors. You must know where you came from, where you are at and know where you want to go as indigenous people,” he said, while stressing that land is a very big part of the Indigenous Peoples’ culture and, therefore, they need their lands to be respected and secured. “People say we have a lot of lands but our culture is different. We use our lands for farming and fishing and hunting and we have great plans for our lands and that is why land is so sacred to us. We love our environment,” he added. Fredericks said that if the Indigenous Peoples’ lands are taken away, then their culture is too. “You take away our cassava bread if you take away our lands,” he added, while stating that they use their lands differently as compared to others and as a result should be treated differently. 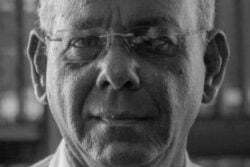 Fredericks’ remarks pertain to the recent Commission of Inquiry on lands that has begun hearings and statements by prominent persons about the size of land awards to the various Amerindian tribes. Referencing the successful request by the NTC for a plot of land to construct its secretariat, Fredericks said that the result is testimony that Amerindians can work along with the government for change. 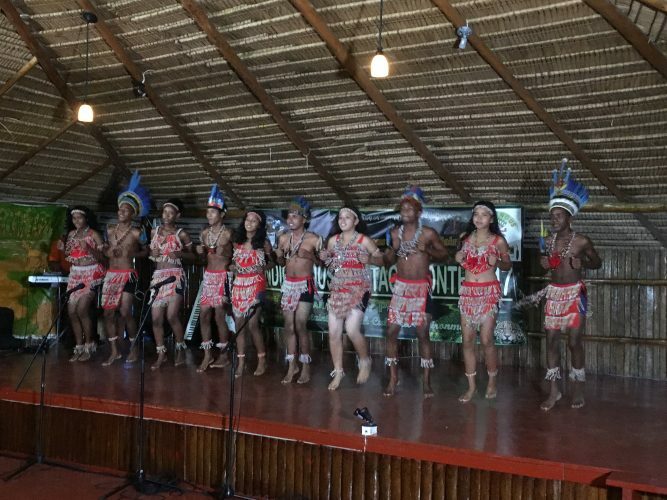 Minister of Indigenous Peoples’ Affairs Sydney Allicock, also made brief remarks and implored the Amerindian youths to embrace their culture and to learn from their ancestors. First Lady Sandra Granger was also in attendance along with Minister of Social Cohesion Dr George Norton, and Minister within the Ministry of Finance Jaipaul Sharma.